Events calendar, where you can see what the dogs and I are up to! Also, my blog, which has lots of dog pictures. "Alkemi" is Swedish for "alchemy", because we hope to create gold (although we're sure not starting with lead!). We are located in Western New York. 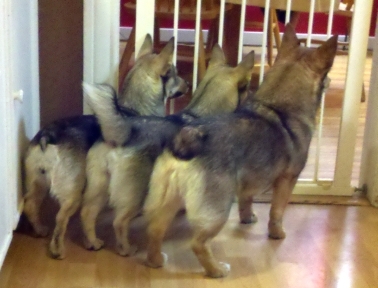 We have had Vallhunds since 2003. Our dogs are well-loved house pets first, everything else comes second to that! My interests are in agility, conformation and rally obedience, and I have a strong commitment to helping to keep this lovely breed healthy and the way it was intended to be: this is still a working farm dog in many places (including its home country of Sweden). We welcomed our first litter on January 15, 2010. I am always happy to talk about the breed. The best way to reach me is by email. Take a look around, you'll find breed information, training information and all kinds of other stuff here! We do not dock tails or remove front dew claws.